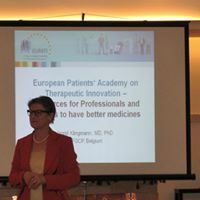 In 2013, MHN joined EUPATI, the European Patients’ Academy on Therapeutic Innovation. This we launched in Malta in 2014. 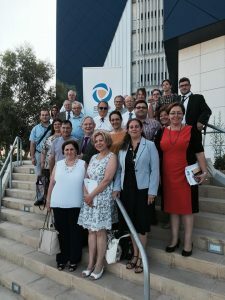 EUPATI was an IMI initiative involving 33 members led by EPF whereby they developed a training program and trained 100 patient advocates of which 2 are Maltese. We launched also the online toolbox and library which will also be available in Maltese in 2017. For the closing event in Malta we were honored with the presence of Dr Ingrid Klingmann from EUPATI. 2 seminars were held one at Mater Dei Hospital which was addressed by Hon Helena Dalli, Minister for Social Dialogue, Civil Rights and Consumer Affairs. Other speakers were Dr Anthony Gatt and Prof. Pierre Mallia. 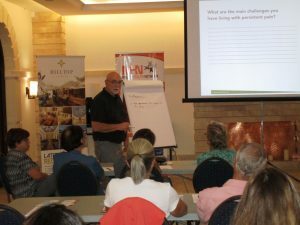 A second seminar was held in the evening at Hilltop Gardens. On the occasion of the World Day Against Pain. 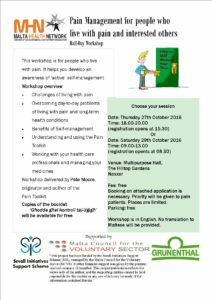 Thanks for funding received through the SIS funds and Grunenthal, this year we offered training workshops in Pain Management for patients and professionals. Details are in posters below. Both workshops were delivered by Pete Moore. The 2 workshops for Pain patients – were held on 27th October and 29th October. Another workshop if for Professionals who work with Pain Patients was held on 28th October. 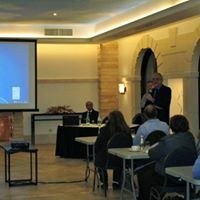 These workshops were part of project ‘Relieving the Suffering of Chronic Pain Patients’, which was supported by Small Initiatives Support Scheme (SIS Funds) which are managed by the Malta Council for the Voluntary Sector on behalf of the Ministry for Social Dialogue, Civil Rights and Consumers Affairs. 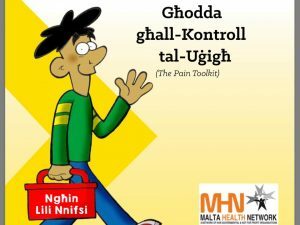 Malta will be hosting the Societal Impact of Pain 2017 in Malta, during the Maltese Presidency of the Council of Europe. On the Occasion of Patient’s Rights Day the Malta Health Network once again pleased organised a seminar for patients, carers, general public and all interested. This was held at San Anton Palace, Attard on Monday 25th April 2016. This event was supported by PRIMA. The main item on the agenda was discussion and feedback on the consultation process for the Maltese Patient Charter. Feedback collected on the day was then passed on to the health authorities. The final version of the Maltese Patient Charter includes some of our feedback but is not fully to what MHN wanted. On the day MHN joined an EU campaign on information on the Cross Border Directive. This is an initiative of Active Citizenship Network.